Discover unique save the date ideas for your wedding announcements. Add your date and even your photograph to most any wedding Save the Date US postage stamp. Click any of these customized stamps for a closer look. Modern and elegant this Save the Date postage stamp features the text "Save the Date" and a wedding or engagement ring with a red heart inside. Graphically simple and pleasing to the eye. Works with all colors. Colorful illustration of a tuxedoed groom and gowned bride arm in arm. Cute Save The Date wedding stamp. Save the Date wedding stamp with a blackboard background and handwritten fonts with a white chalk appearance. Your photo, your names and date. Beautiful diamond ring nestled within the petals of a red rose on this attention getting Save the Date wedding stamp. Customize with your names and wedding date. Matching cards available. 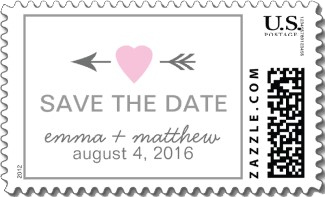 Modern save the date postage has a pink heart and a charcoal gray arrow. All text can be easily changed. Change "SAVE THE DATE" to "Thank You" and You're Invited"
Save the date wedding stamp with modern minimalist design with the words "Save the Date" in gold hand lettering script font. Add your wedding date and choose your background color. Shown in white. 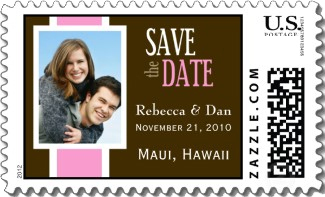 Extremely personalized Save the Date wedding stamp with your photo, names, date and even location. Fun beach theme Save the Date stamp. Interlocking hearts drawn in beach sand with your names inside. You can also change the "Save The Date!" text and use this design for your other wedding correspondence. This Save the Date wedding Stamp has your monogram in light blue with a stylish black and white damask design. Change the text "Save the Date" for coordinated correspondence. Elegant white tulips on a soft blue background are a compelling image on this Save the Date wedding stamp. Elegant off white and red with stylish floral design. Add your photo. 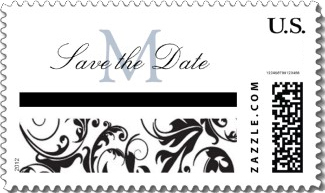 All text can be changed to use this Save the Date wedding stamp on other wedding mailings. Romantic "Fly Me To The Moon" Save the Date wedding postage with two lovers in silhouette against a large full moon. Alter any and all text for a coordinated look. Love birds Save the Date floral wedding stamp in soft reds and grays. Add your date and even change the text for "thanks" and invitations. Elegant cream ribbon on black. Add your names and date for a stylish Save the Date wedding stamp. Choose from four other ribbon colors. Lovely sepia toned rose with the script "Save The Date" in a swirly and stylish font. 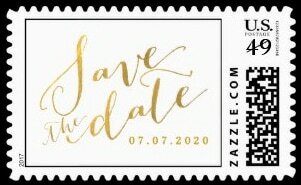 A classy Save the Date wedding stamp. 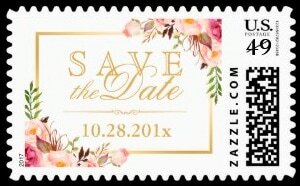 Modern and elegant Save the Date wedding stamp with floral and gold framing. Customize with your date. This Save The Date wedding stamp boasts a beautiful full frame cream rose with the text "Save the Date" in black script near the bottom. Custom Save the Date wedding invitation postage is an easy way to dress up any of your wedding correspondence. Discover unique save the date ideas for your wedding announcements. Create a personalized stamp when you add your date and even your photograph to most any wedding Save the Date US postage stamp. Click through any of these customized stamps to access the text and photo upload windows to create your personalized stamp.